Don’t struggle on your own this Christmas. Christmas should be a magical time of the year – a time to let your hair down and enjoy yourself. But for many local people, behind the sparkle of the Christmas decorations and twinkle of the fairy lights Christmas can be a very tough time – one filled with stress, worry, loneliness and depression. Seeing everyone else seemingly enjoying themselves and having a good time only amplifies the problem and can make things even tougher to take. It can feel like you’re on your own – the only person to be facing a difficult time. 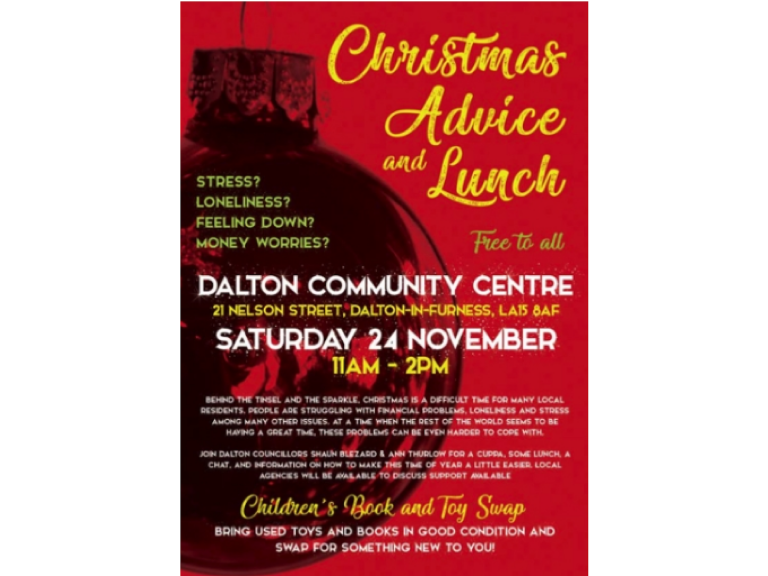 This Saturday (24th November 2018) Dalton Community Centre are holding a Christmas Advice and Lunch. This free event starts at 11am through to 2pm and could be the best event you attend this year! It provides those who may find this time of the year a struggle the opportunity to join Dalton Councillors Shaun Blezard and Ann Thurlow, for a cuppa, some lunch and a chat. It’s also a fantastic opportunity to find out more information about the support local organisations can give to make this time of year a little easier. Local agencies including Barrow and District Credit Union, Dropzone and Dalton churches will be available to discuss the support available. There will also be a children’s toy swap and a book swap at the event too. So bring your used toys and books in good condition and swap them for something new to you! When you’re struggling it’s easy to feel alone, that no-one understands, please don’t struggle on your own, come along to this free event and see the range of help that’s available to you.